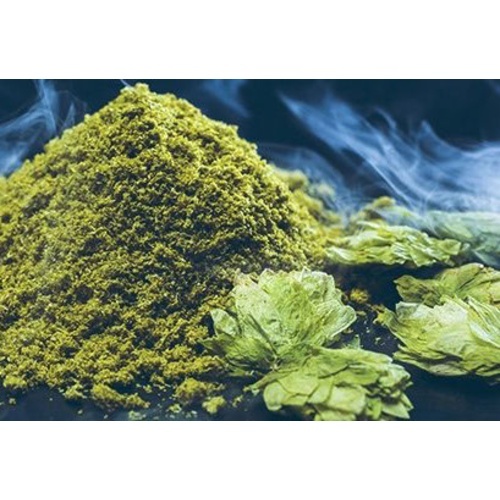 Simcoe Cryo Hops (LupuLN2 Powder) 1 oz. $4.99 & FREE Shipping on orders over $59. Cryo Hops provide brewers with the ability to get gigantic hop character while reducing astringent and unpleasant vegetal flavors. With a substantially higher oil and resin content, LupuLN2 powder offers up all the flavor and aroma of a heavily hopped beer, but with a significanly reduced grassy character. Additionally, the lower dosage rate of the concentrated powder reduces the volume of trub and therefore, kettle loss. Using Cryo Hops you will net more beer that is clearer! Typical usage of Cryo hops would be roughly 50% of pellets. LupuLN2 powder can be used in any application where traditional hop products are utilized, including: Bittering, Kettle, Whirlpool and even direct to the fermentor. It is suggested that you use Cryo Hops as late additions, in the whirlpool or dry hop, as the volatile aromatic compounds will be driven off if added early in the boil. Cryo Hops are an innovative hop product that is made by separating the lupulin from the hop flower using cryogenic processing. The result is a product with twice the potency of T90 pellets, with reduced astringency and vegetative material. Note: These hops come pelletized. The powder is compressed into pellet form to make handling easier. I am making a DIPA and am trying to reduce trub loss. All of the Cryo Hops yield a concentrated hop punch to the kettle without the volume of vegetal hop material to deal with. To get better aroma from dry hopping. hop seem to stay fresher longer in this format, produces great hop flavor, less vegetal material to soak up beer, and drops out of suspension during cold crash. Great hops for dry hopping, less green mater and lots of flavor!!! This is a very tasty and fragrant hops. It excels in late whirlpool and dry hop applications. I would use this lupulin powder in late additions in the boil and also for dry hopping. It works extremely well when paired with pellets. Use the pellets for bettering and middle additions to the boil. I would also say that it reduces the amount of trub you have after fermentation. I highly recommend using the lupulin powder if you can! The aromatic qualities of the lupulin powder greatly outshine that of its pellet counterpart.